These are all simple and free to implement, it’s just a case of allocating the time to put them into practice. If time is what you are struggling to allocate to your workload, contact me for a bespoke quote tailor made for your website and industry. We rank well thanks to the content we produce. It’s the best way to make your site relevant to the terms people are searching for and to give people a reason to visit your site. This means making sure the content on every page works as hard as it can. It worked for us. It shouldn’t be done purely as an SEO play, as simply producing content to cram in keywords won’t work in the long term. Instead, write for your audience and produce a blog that brings people to the site again and again. That’s content marketing for you. It can be easier to write for some business types than others, but there’s generally an angle to be found. 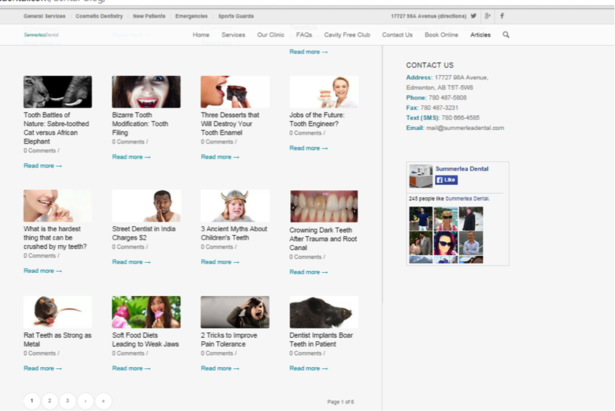 If dental clinics can find ideas for articles, so can you. The side effect of this blogging activity is that, over time, you’ll have relevant and frequently updated content for search engines to index. Don’t become obsessed with cramming every keyword you can into a blog post or product description, aim to produce relevant and interesting pages first and foremost. Don’t write for the search engines, write for your readers. Social media is a great way for small businesses to build their online presence full stop, and it’s well worth experimenting to find the sites that work best for your business. As a first step, set up profiles with accurate contact and web address details on the major social sites. There are no easy shortcuts to rank organically. A good SEO agency will help you to rank as highly as your site can, but it simply isn’t possible to guarantee page one rankings. Agencies promising such nonsense are likely to do more harm than good in the long term, and help to give SEO a bad name. Also, you don’t necessarily need an agency to improve your SEO efforts. Following on from the previous point, quick results have been achieved in the past by techniques such as aggressive link building. Even if this does work short-term, the methods used are likely to have repercussions further down the line, perhaps in the form of a Google penalty. Keep an eye out, and if you suddenly have hundreds of inbound links from Polish tractor forums, then it’s time to worry. People should be able to guess the topic of a page by looking only at its URL. This is content that doesn’t age too quickly. Unlike news-related posts, evergreen content should keep visitors coming to your site long-term. This is great for search too, as this kind of content is more likely to rank on a long-term basis. 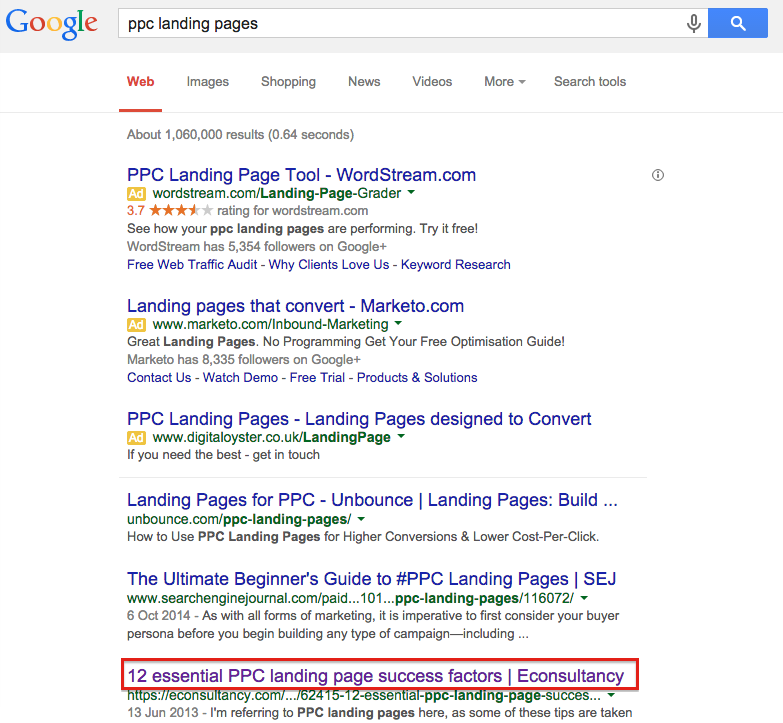 For example, this post on PPC landing pages was published in July 2013 but is still ranking highly for this competitive term. Find out what the sites ranking on page one for your target keywords have done, on-site and off-site, to achieve this. 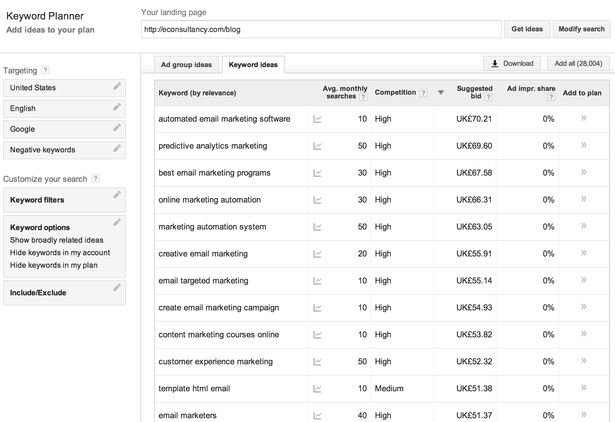 This is great for generating ideas for keywords and seeing how competitive they are. In this example, we’ve used our own blog as the ‘landing page’, but you could use URLs of competitors to find new phrases to consider writing about. This is explained in more detail here, but basically the tool will extract a bunch of keyword suggestions based on the content found via the URL you submit. Smart use of internal linking can help you to rank for certain target keywords, as well as helping your visitors to find useful or related content. Keyword stuffing is something Google will spot easily. It also looks bad for visitors and affects the quality of pages. Think of one or two keywords and phrases to target and use them naturally. Use semantically related words and phrases to avoid repetition. The terms that people enter into your site search box can help you to identify target keywords. This is because the keywords that people use to search within your website, for products or information, are very likely to be the same keywords they use on search engines. This is free, and an easy way to increase your presence in local search results. Here, David Moth explains how to go about this. Good reviews will help to give your result more prominence on Google. SEO is a long-term strategy and may take time to produce results, especially in competitive sectors. If you’re doing the right things, it will work in the long term. Google is focusing heavily on mobile optimisation, adding text and labels to mobile search results to indicate those sites which are ‘mobile-friendly’. You need to provide the best mobile experience you can for users. You can test your won site using Google’s ‘mobile-friendly’ tool. Ensure your images have alt tags on them and include keywords (naturally) in the filename. Make sure analytics tracking code is installed – the standard version is still free and unless you have a strong reason to opt for an alternate platform this is the one you should be using. It’s very quick and easy to install regardless of platform so it shouldn’t cost you more than 30 minutes of their time. Here’s some more detail. Having a GWMT account means Google can tell you about any specific problems it’s having accessing your site. Or if it believes your site has been hacked and delisted from the search results, view and query your links and traffic sources (according to Google), lets you submit sitemaps, tell Google how you want your site to appear in the SERPS and much more. Schema markup is explained in more detail here, but basically it’s a way to help your site’s results stand out a little more. Create unique content for each physical location, but make sure it is relevant to the user. Opening times, contact details and store address should be there, but think of other ways to make these pages more useful, such as adding images, menus, facilities on offer and so on. Even better, create this content at a local level if possible, using store staff. Google is increasingly focusing on things which affect the user experience when ranking sites – mobile optimisation, site speed and so on. The page’s title tag should include the brand name, the keyword being targeted and the location. You should also think about this with the meta description of the page. This should be possible to achieve without making either page or meta description come across as unnatural, as the objective remains to optimise for both users and search engines. Finding out who is linking, and the pages they’re linking to can help you to find out which content is working for you. Google also recognises partial citations, so references of business name + address or address + phone number. Quite often retailers are caught up with ‘samey’ product copy and certainly for branded items which are sold through various websites it can be difficult to differentiate your product copy. I would recommend, where it is feasible, to write specific copy for each item. This is great for your own conversion rates, and also gives Google more unique content to crawl. 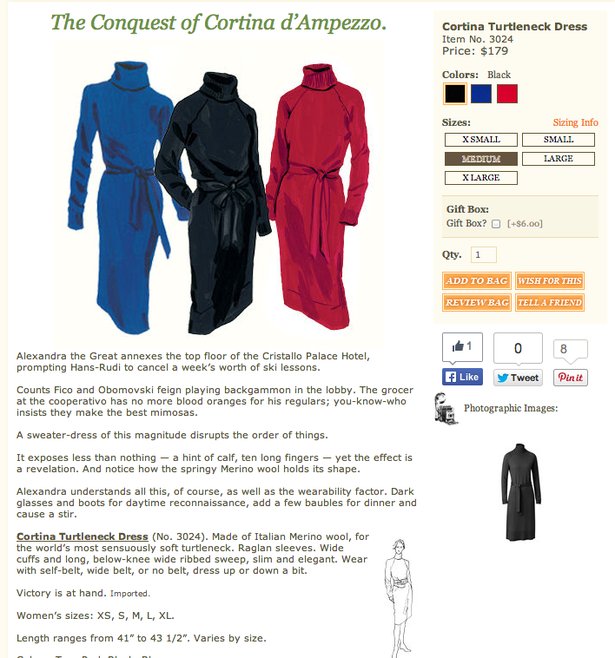 It doesn’t have to be quite as florid as J Peterman’s copy, but it should speak to your customers. Tracking target keywords can help you to see how your SEO efforts are working out. If you make some changes on site or produce some content, what effect does this have on rankings? There are plenty of paid tools to track large numbers of keywords, but at the most basic level you could track them manually with the help of a spreadsheet. Without wishing to contradict the previous point, it’s important to remember that search rankings are fluid and can change according to the searcher’s location, device, search history and so on. Look for general up and down trends rather than worrying about moving every term up one or two places. Search rankings are fluid, and can vary according to the searcher’s location, device and so on. It good to encourage user reviews, first and foremost to improve conversions, but also because they can help for SEO. Google’s algorithm changes regularly, and SEO tactics that may work now could become obsolete in the near future, just as guest blogging for links has become a no-no. Keep an eye on Google’s Webmaster Central blog, and sites like Moz and Search Engine Land are great for keeping up with SEO trends. 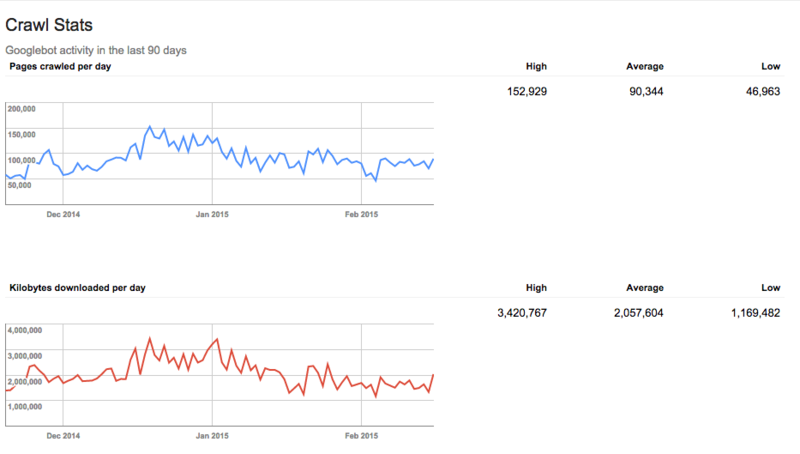 Yes, you should try and rank as highly as possible, but SEO shoudn’t be chased as the expense of other channels. Imagine what would happen if Google removed all your results – would you still have enough traffic from other sources to keep going? We value search traffic, but we work hard on other channels too. If Google banned us from its results it would hurt, but we’d still have plenty of visits from email and social. Being too reliant on search makes your business vulnerable to the whims of Google’s algorithm changes.